A number of new features have been added to the MAST Discovery portal, including the ability to quickly share searches and to display search results as an album of images. The MAST Data Discovery Portal (http://mast.stsci.edu) has been updated with many new features, datasets, and infrastructure improvements to expand on its role as the multi-mission interface for all MAST resources. Figure 1: MAST Data Discovery Portal Advanced Search interface. The new features include an Advanced Search form (Figure 1) that enables graphical filtering of the entire MAST collection of observations across all missions. Users can now quickly filter over two million observations to converge on a scientifically specific dataset for further exploration inside the Portal. A new Album View (Figure 2), alongside the existing Grid View, provides improved dataset visualization within the portal. A new Save My Search link creator (Figure 2) allows users to save a search query as a URL and then share it with colleagues to retrieve the same dataset from MAST. Figure 2: Search results displayed in the Album View. The link icon generates a link to the search results, allowing for quick sharing or saving of query results. 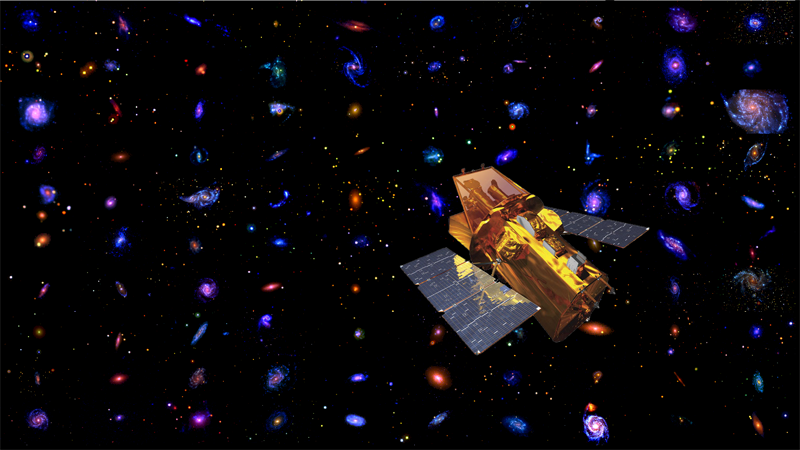 New datasets have also been added to the Portal, including the Hubble Source Catalog (HSC) Version 2. 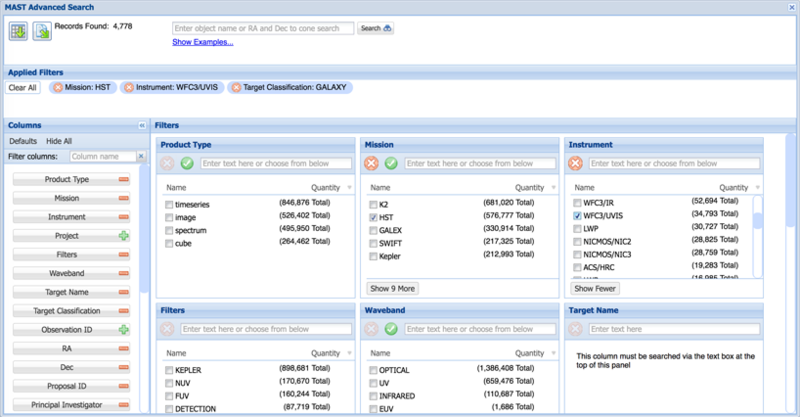 The HSC interface provides a view of the HSC source detections along with a direct download of the corresponding FITS image. The GAIA DR1 catalog has also been integrated into the Portal positional and crossmatch search capabilities. Also added to the Portal is the PanSTARRS All Sky Visualization. Users can now select this background inside the AstroView all sky viewer with loaded datasets rendered in the foreground. 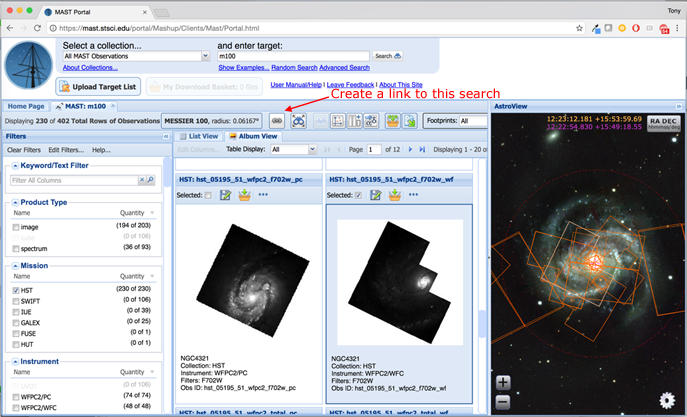 Check out these new features along with the all the existing capabilities at http://mast.stsci.edu. Please email us with questions at archive@stsci.edu. 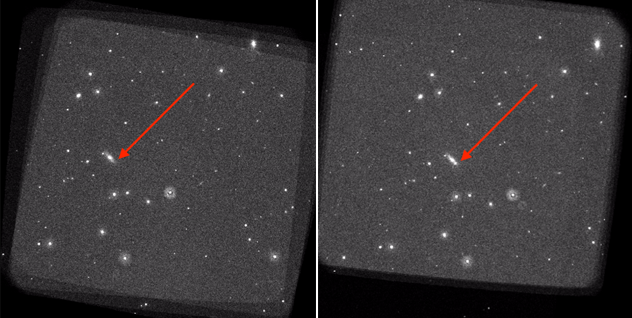 The HST WFC3/IR detector occasionally exhibits image persistence following observations of bright sources. MAST and the WFC3 team provide persistence products and tools which allow users to explore the impact of persistence on a given dataset. The HST WFC3/IR detector occasionally exhibits image persistence, particularly in exposures that follow observations of bright sources that saturate the detector by more than half the pixel full well depth. Persistence manifests itself as ghost artifacts from the earlier exposures, and the amount of persistence is dependent on the charge accumulated by the pixels, the length of the exposure, the time since the earlier exposure, and the location on the IR detector. Figure 1 shows two examples of WFC3/IR persistence. Further information on the characteristics and behavior of WFC3/IR persistence can be found in the WFC3 Instrument Handbook Section 5.7.9 or the WFC3 persistence webpage. 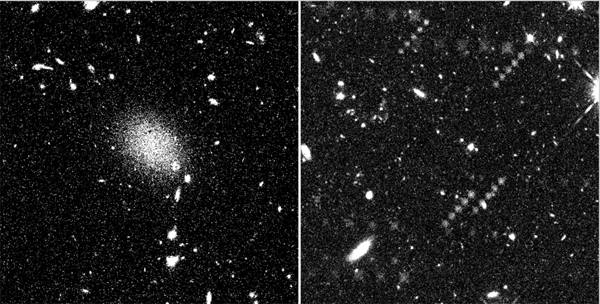 Figure 1: Examples of persistence occurring after HST WFC3/IR observations for a bright nearby galaxy (left) and following dithered observations of two different bright star fields (right), one field dithered horizontally, one dithered diagonally. A model for estimating persistence in the WFC3/IR detector has been developed and implemented as software that predicts the amount of persistence in an image based on the history of earlier WFC3/IR exposures. The WFC3 team executes the software daily on new WFC3/IR data and delivers the resulting data products to MAST to ensure that they are available to users in a timely manner. The persistence products include FITS files that contain the predicted persistence values for the given observation as well as a persistence-subtracted FLT file. These products can assist observers in evaluating the effects of persistence in their science exposures. Further details about the persistence products are available here. 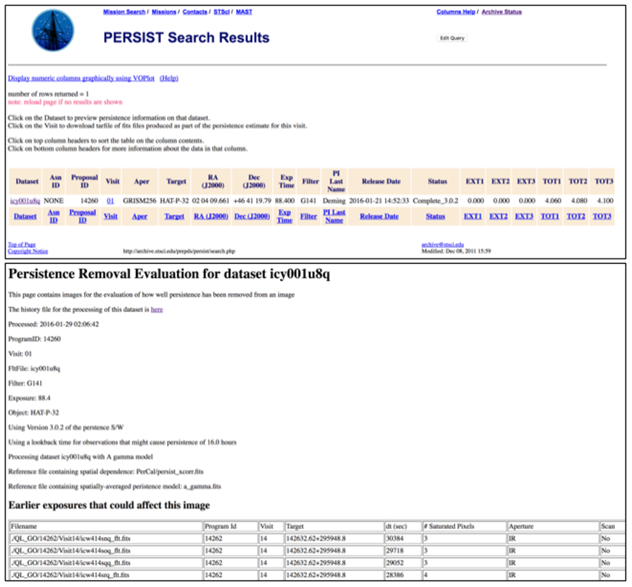 Figure 2: PERSIST search results for an example dataset (icy001u8q) (top) and the resulting persistence removal evaluation page (bottom). Users can click the Visit number to download the persistence FITS files. WFC3/IR observers are encouraged to check if their exposures are potentially affected by persistence. The MAST persistence history tool allows users to search the archive for WFC3/IR exposures preceding a given dataset; if there are no IR observations within a few hours prior, then it is unlikely that the dataset is affected by persistence. For observers with images affected by persistence, the WFC3/IR persistence products are available through the MAST archive via the PERSIST search form. Users can build a query to search for particular observations via target name, dataset, proposal ID/visit, etc. (similar to the HST search form). The result is a table that provides links to the persistence products and the persistence removal evaluations for each dataset (See Figure 2). Users with questions about WFC3/IR persistence and the various persistence products are encouraged to send them to help@stsci.edu. MAST is now hosting a curated archive of 253 supernova observations in the UV/optical from Swift/UVOT. Swift supernovae mosaic constructed from actual observations and a Swift rendering by NASA/Sonoma State University/Aurore Simonnet (Peter Brown). Figure 1: Example SOUSA template without (left) and with (right) a supernova. SOUSA is a project lead by Peter Brown (Texas A&M) to reprocess Swift supernova data using zeropoints from Breeveld et al. (2011) and applying time-dependent sensitivity corrections on a consistent system ( Brown et al. 2014). A total of 253 supernovae are included in the first release. Each supernova can have observations in up to six filters (UVW2, UVM2, UVW1, U, B, V). For each filter, two summed images are created: one containing the supernova, the other without the supernova but containing the host galaxy (a “template” summed image; see Figure 1). A table with all the supernova targets, supporting documentation, and the processed images (available as FITS files) are available at MAST: https://archive.stsci.edu/prepds/sousa/. The light curves are available on the external team page located here. Questions about the SOUSA project can be emailed to the Archive Helpdesk at archive@stsci.edu or posted on the MAST Forum.